Calling all girls in 5th - 7th grade! Grab your mom (or some other book-loving adult) and bring her to Red Balloon’s Girls Read Book Club. Meet other girls and moms and share the fun of reading. Girls Read meets every fourth Monday. April's book selection is Escape from Mr. Lemoncello's Library by Chris Grabenstein. Call the store, 651-224-8320, for more information and to sign up. Chris Grabenstein visits Houston as part of Inprint’s “Cool Brains” series. Chris Grabenstein is an award-winning author. His debut John Ceepak mystery "Tilt-A-Whirl" was included on several "Best Mysteries of 2005" lists and won the Anthony Award for "Best First Mystery." Chris lives in New York City with his beloved wife J.J., three cats and a dog. Where: Johnston Middle School, 10410 Manhattan Drive, Houston, TX. Doors open at 2:30 pm. Join New York Times bestselling author, Chris Grabenstein, for a reading and signing of his new middle grade novel, The Island of Dr. Libris. What if your favorite characters came to life? Billy's spending the summer in a lakeside cabin that belongs to the mysterious Dr. Libris. But something strange is going on. Besides the security cameras everywhere, there's Dr. Libris's private bookcase. Whenever Billy opens the books inside, he can hear sounds coming from the island in the middle of the lake. The clash of swords. The twang of arrows. Sometimes he can even feel the ground shaking. It's almost as if the stories he's reading are coming to life! But that's impossible…isn't it? Places in the signing line are reserved for those who purchase a copy of The Island of Dr. Libris from The King's English. Adventures come to life in the world of Dr. Libris. And young readers can visit that imaginative place through the words of author Chris Grabenstein in his book, The Island of Dr. Libris. 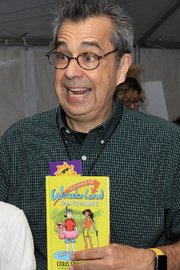 Grabenstein will share his book with fans in Naperville. The Parent Child Reading Group will meet at the Saratoga Springs Public Library on January 20 at 6:00 pm to discuss Escape from Mr. Lemoncello's Library by Chris Grabenstein. If you are a member of this reading group, please stop by the Northshire Bookstore to pick up your reserved copy of this title (and to receive a 20% discount). We currently have so many excited readers that this group is full! For more information about the group or to be placed on the waiting list email ReadingGroupsNY@northshire.com. 2PM SATURDAY, JANUARY 4 Tween Event | Club Read: Escape from Mr. Lemoncello's Library ﻿Club Read members gather for some free grub from Clockwork Pizza and a discussion of Escape from Mr. Lemoncello's Library by Chris Grabenstein, who attends via Skype. ﻿Kyle Keeley, an ardent fan of all games, just won an invitation from his hero, Luigi Lemoncello, the most notorious and creative gamemaker in the world, and the genius behind the new town library. Lucky Kyle is to be one of the first 12 kids in the library for a night of fun, food, and lots and lots of games. But when morning comes, the doors remain locked. Kyle and the other winners must solve every clue and every secret puzzle to find the hidden escape route. And the stakes are very high. Chris Grabenstein will sign and discuss two books, Riley Mack and Other Known Trouble Makers (HarperCollins; $16.99) and Fun House (Pegasus; $25). Harlan Coben will sign and discuss his newest stand alone novel, Stay Close (Dutton; $27.95). Harlan Coben is the bestselling author of sixteen previous novels, including the #1 New York Times bestsellers "Long Lost" and "Hold Tight." Winner of the Edgar Award, the Shamus Award, and the Anthony Award, Coben lives in New Jersey with his family. Chris Grabenstein is currently considered a "single author." If one or more works are by a distinct, homonymous authors, go ahead and split the author. Chris Grabenstein is composed of 2 names. You can examine and separate out names.